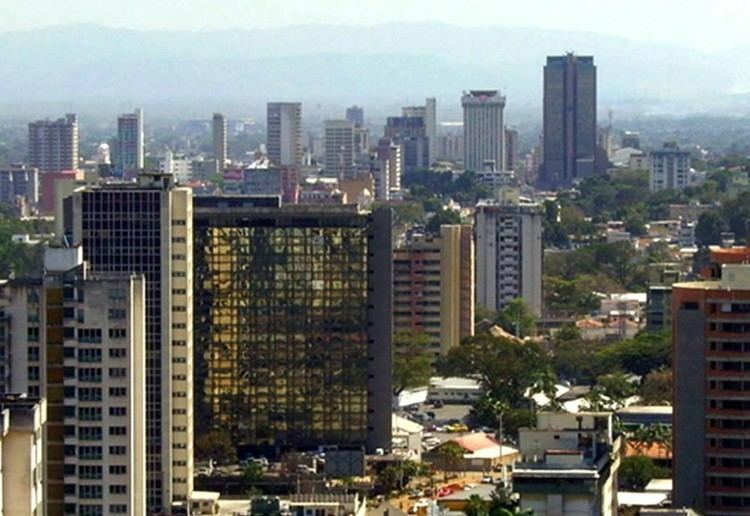 Carabobo State (Spanish: Estado Carabobo, [esˈtaðo kaɾaˈβoβo]) is one of the 23 states of Venezuela, located in the north of the country, about two hours by car from Caracas. The capital city of this state is Valencia, which is also the country's main industrial center. The state's area is 4,369 km² and as of the 2011 census, had a population of 2,245,744. Carabobo State was the site of the Battle of Carabobo on 24 June 1821. This was a decisive win in the war of independence from Spain, and was led by Simón Bolívar. The municipalities are made up of one or more civic parishes. Carabobo has a total of 38 parishes. Around 75% of the region is covered by mountains that make up part of Venezuela's Coast Mountain Range. The highest peaks are found on the north and west of the state and south of the Valencia Lake. The Cobalongo or Caobal peak is the highest point of the state, at 1990 metres above sea level. There is a central low plain around the Valencia Lake and towards the south, where Venezuela's Llanos start. There is a large amount of anticlinals, synclinals, diaclases, fractures and faults. 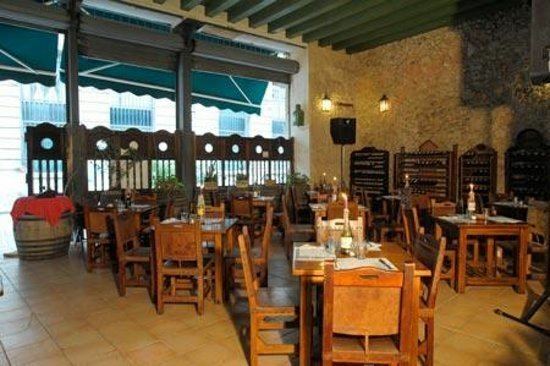 One of the most important is the one of the Victoria, south of Valencia. This area has moderate tectonic activity. Mountains are very steep; some slopes are over 80%. On the plains, slopes are less than 1%. In the Tocuyito area, slopes can reach 5%. There are a group of small islands near Puerto Cabello. The main ones are Isla Larga, Isla Santo Domingo, Isla Alcatraz and Isla del Rey. Isla Larga is the largest and is 1855 metres long. It makes part of the San Esteban National Park. There are also a couple of islands on Lake Valencia. Some more have disappeared after the rise in sea level since the 1970s. Isla del Burro ("Donkey Island") is the largest island of the lake. Carabobo's soils are fertile. Entisol soils predominate (above all Fluvents and Orthents). There are also threats of vertisols with suborders of Usterts. 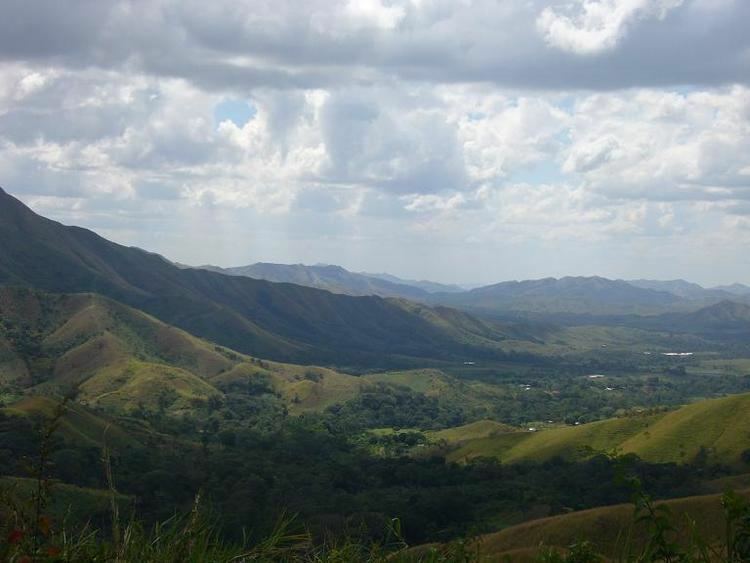 The fauna of Carabobo mainly inhabits the tropical forests, grassland surrounding and mountainous landscapes. Though a richly inhabited land, the pollution of many of its lakes and rivers has caused the wildlife of Carabobo to be transformed and mutalated, adapting itself in order to survive. The vast majority of wildlife that remains is predominately birds due to their ability to be able to fly in search of cleaner water. Typical fauna include the Frilled Dragon, Carabobo Tree Frogs and Valencia Piscavi. Wild birds such as the Sugar Glider, Olive-backed Oriole, Whip-tail, Poonbill, Scrub Mullet and Mopoke. Insects such as Forest Floor Skink are commonly found. Carabobo has a typical tropical vegetation, including prosopis, apamates (Tabebuia rosea), camorucos, mahogany, cedars, guamos Carabobo palms, and Samanea saman. On the coast there mangroves like the red Rhizophora mangle, as well as coconut trees (Cocoloba uvifera). The Valencia Lake and several main rivers are very polluted. A large volume of residual water pours into them without any processing. In the mid-20th century, people could still bathe Valencia Lake. There have been various projects for improving the quality of its waters, but little progress has been made. Sewage regulations are often ignored. There are some processing plants in the area of Los Guayos, but this is far from optimal and does not cover all possible flows into the Valencia Lake. There are also many unofficial rubbish depots that do not comply with international standards. The rapid demographic growth has led to the loss of large forest and agricultural areas. Even if many regions around the Valencia Lake have been officially reserved for agricultural purposes, they are often being turned into urbanized zones. When Europeans arrived to what would become Venezuela, one of the most important cultural centres was located around the Valencia Lake. The Native Americans in the region were hunters, gatherers, but also fishers and farmers. Many petroglyphs and ceramics remain from this time. There are signs of human presence in the Valencia region from the fourth millennium BC onwards. Humans were also present earlier in other areas of what is now Carabobo, like in Bejuma. An important human settlement occurred around the Valencia Lake between 200 and 1000 AD. These people already practiced some kind of agriculture. At the end of the first millennium new populations started to arrive from the Orinoco region, probably via the El Pao River. From the eighth century onwards the Orinoco populations started to merge with the older groups. This fusion produced what is known as Valenciode culture . People lived in houses built on artificial mounds in the very fruitful valleys to the East and West of the Valencia Lake. They produced specially anthropomorphic sculptures. Around the year 1200 the Valencioide culture reached the whole area of the Valencia Lake basin, the centre of Northern Venezuela and several islands in the Caribbean. The Indians would trade sea products like the (Strombus gigas), salt (specially from the Paraguana Peninsula), turtles and fish from coral riffs. The trade took place in villages along the coast. Taramainas, Tacariguas and other tribes inhabited the Valencia Lake region when the Europeans arrived. The different groups spoke mostly Arawac languages, but there were also several Carib groups. The Indians grew maize, a typical product of Western South American cultures and also Manioc, a typical product of groups from the East. Many metates or grinding stones for maize as well as budares for the preparation of cassava remain from those times. The Jirajara Indians from Nirgua (now a region between Yaracuy and Carabobo), would go to the Valencia Lake and from there through the mountains to the Sea at the level of Borburata to get salt. Juan de Villegas founded the town of Borburata in 1548. Seven years later, in 1555, he founded Valencia in the central plains to the west of the Tacarigua (Valencia) Lake. In 1577 and 1583 the region of Valencia suffered a series of raids by Carib tribes coming from the Low Orinoco. The Spanish troops led by Garci-González repelled and went after them. 1564: British pirates led by John Hawkins 'forced' the Borburata settlers to buy his cargo, about two hundred Africans from the Gambia region and some European products. 1568: John Hawkins attacked Borburata again and sold his new cargo of slaves. The main part of that cargo was a group of 400 Africans he had captured and enslaved in Western Africa. In 1624 Indians to the Northwest of the Valencia Lake established the settlement of Guacara. Attacks by English and French pirates continued during a great part of the century. In 1659, the English pirate Myngs plundered Puerto Cabello on a raid that had taken him to Cumaná and later Coro. In 1677, Valencia was plundered by French pirates, who burnt down the Ayuntamiento or "City Hall" and destroyed most historical documents. At the beginning of 1694, the governor of Venezuela, Francisco Berroterán, declared the growing Guacara, Los Guayos and San Diego doctrinas, "towns of Indians". The Compañía Guipuzcoana de Caracas, a company organized by Basque entrepreneurs, received the monopoly of trade between Venezuela and the rest of the world. In that context, the company built in 1730 the haven of what would become Puerto Cabello. In 1800, German scientist Alexander von Humboldt explored the area in his South American trip. Venezuela's independence was declared on 19 April 1810 in the Casa de la Estrella, in Valencia. The Independence act was signed there the next year, 5 July. Several very important battles between Spanish royalist forces and the pro-Independence troops under Bolivar took place in the Carabobo region. 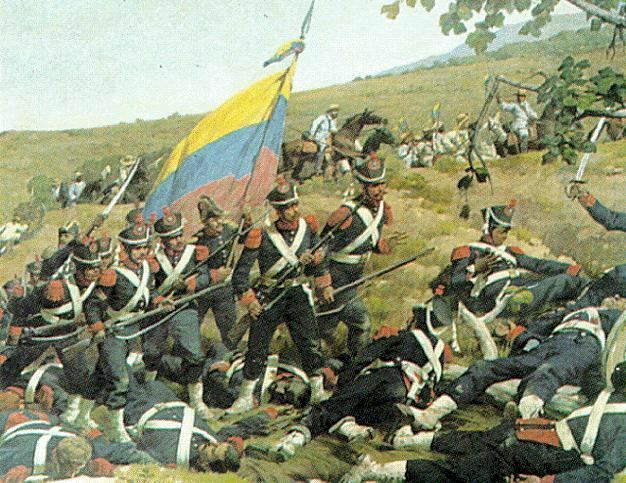 The most important was the Battle of Carabobo, fought on 24 June 1821 and considered a key battle in the struggle for Venezuelan independence. After the battle, what was left of the Spanish forces holed up in the San Felipe Castle in Puerto Cabello until 10 November 1823, when they surrendered and left Venezuela. On 6 May 1830 the Congress of Valencia takes place. There, Venezuela declared the independence from the Great Colombia and Valencia was declared Venezuela's capital. 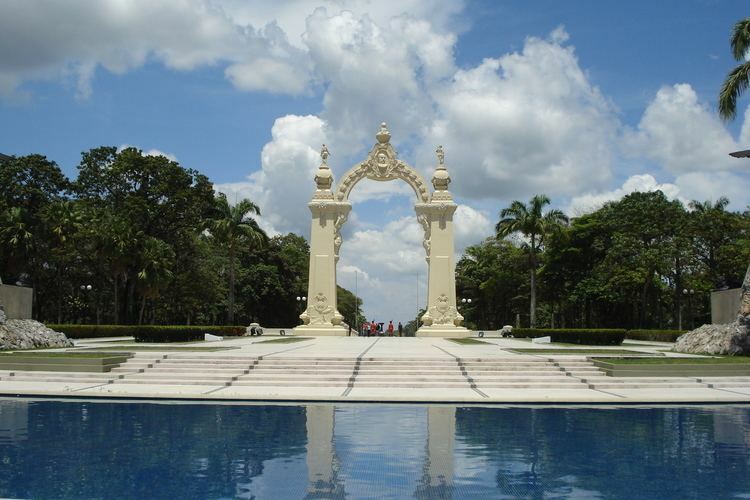 On 29 March 1832 the central government created the province of Barquisimeto from a part of Carabobo. In 1858, during the March Revolution, Valencia became again capital of Venezuela. On 27 April 1881 the central government reforms the administrative divisions and creates the state of Carabobo, which at that time had a part that later was given to Yaracuy. During World War II, the crews of several Italian ships and one German ship took refuge on the Puerto Cabello bay. On 31 March 1941, they set fire to their ships to prevent US troops from capturing them. A big fire in the haven of Puerto Cabello ensued. Several hundred marines were captured. Many of the Italians eventually would decide to settle down in Venezuela. In the second half of the 20th century, Carabobo experienced a population explosion. Many immigrants arriving from Europe to Venezuela after WW2 settled down in Valencia and surrounding areas. From the 1970s onwards, immigration came mainly from other Latin American countries. The La Cabrera Tunnel was constructed in the late 1950s using the New Austrian Tunnelling method. The first local elections for governors took place in 1988. Salas Römer became elected governor of Carabobo. After the Vargas flood of 1999, thousands of homeless people from that area moved to Carabobo and settled in slums in the Naguanagua and Valencia regions. Since 1999 and specially after 2004, Carabobo suffered a dramatic increase in crime. The state is now one of the areas with the highest murder rates in Venezuela. Hugo Chávez's proposal for constitutional reform was defeated in Carabobo during 2 December 2007 referendom by 52.82% of the population. The most important industries in Carabobo include food processing, textiles, galvanizing, chemical, petrochemical, metal-mechanic, car assembling, fuel, liquified gas, ceramics and paper factories. The industrial centres are located in southern Valencia and in Guacara. The state-owned petrochemical and oil industrial complex of PDVSA (Complejo de Refinería El Palito) is located on the western coast, close to Morón. A major oil distribution centre is in Yagua. The region is seat to important shopping and entertainment centres. Tourism, mainly local, plays an important role. Carabobo has very productive soils for agriculture. There are important areas for farming in the North and South of the Valencia Lake. Unfortunately, high urbanization has led to the loss of very valuable lands that could otherwise be used for cultivations. There are many farms of pigs and cows, specially to the south of the Valencia Lake and on the western part of the state. an insectarium and a small zoo with animals proper to Venezuela. Universidad Nacional Experimental Politécnica de la Fuerza Armada (Núcleos en Valencia y Puerto Cabello). Among the main research centres Carabobo counts with FUNDACITE (Foundation for the Development of Technology in Carabobo) as well as the University of Carabobo, specially the Faculty for Science and Technology. Carabobo's folklore shows the influence of Native American, European and African components, as in most of Venezuela. The coastal regions have many traditions heavily influenced by African traditions. The mountain regions have rather European and Native American influences. Drum-based music is very popular in the towns along the coast, from Morón to the Patanemo area. On 23 June, those towns celebrate the cult to San Juan Bautista (Saint John the Baptist). The village of Borburata is specially known for its festivities. The town of Yagua has a Festivity of the Flowers (Fiesta de las Flores) starting with a procession to the nearby mountain, with a parade where the most different flower motives are shown through the village and the usual town celebrations. The main newspapers of the region are El Carabobeño and Notitarde. Guillermo Tell Villegas, interim president of Venezuela. Hermógenes López, interim president of Venezuela. Luis Pérez Carreño, physician, creator of the Clinic for the Poor Children. Robert Machado, MLB player for the Chicago White Sox, Montreal Expos, Seattle Mariners, Chicago Cubs, Milwaukee Brewers, and the Baltimore Orioles. Ruben Quevedo, MLB player for the Chicago Cubs and Milwaukee Brewers. Pablo Sandoval, MLB player for the San Francisco Giants. Henderson Álvarez, MLB player for the Miami Marlins. Jacqueline Aguilera, Miss Venezuela World 1995, Miss World 1995. Salvador Pérez, MLB player for the Kansas City Royals, and MVP in the 2015 World Series. José Altuve, MLB player for the Houston Astros wears jersey #27, plays 2B, is one of the shortest players in the major leagues and one of the shortest players to ever play pro baseball, listed at 5'6"
Félix Hernández, MLB pitcher for the Seattle Mariners, he is one of the top pitchers in MLB and a future Hall of Fame member.